On the Spokane Indians, first baseman Todd McDonald or starting pitcher Tyler Phillips each boast walk-up songs that do exactly that. 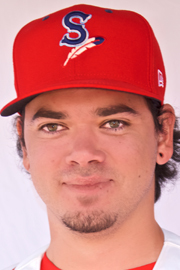 McDonald, who is from Brisbane, Australia, chose two metal songs for his walk-up to the plate, “Traveller (The Fool)” by In Hearts Wake and “The Calling” by Northlane. McDonald says he began listening to his favorite metal genres, Metalcore and Deathcore, when he was about 14 years old and was instantly hooked. Not only does his walkup songs portray his love for metal music, but they pay homage to his home country. In Hearts Wake and Northlane are both from Sydney, Australia. While it’s one of his passions, McDonald’s love for metal music isn’t shared among his teammates in Spokane. Unlike McDonald, Phillips isn’t as serious with his walk-up music. While it hasn’t been played for him yet — on-field promotions before the game make it difficult to play starting pitchers’ walk-up songs, Phillips requested “At Last” by Etta James, a love song released in 1960, for his walk-out music. “It’s the kind of song that’s going to put a smile on your face,” Phillips said. While some may argue the song is more appropriate at a weeding ceremony, Phillips’ reasoning behind picking “At Last” has a few layers to it. Mainly, Phillips says he likes to stay relaxed on the mound, and the string instruments at the beginning of the song are soothing for Phillips. One of the other reasons is more creative. “My idea was that I’d be going out to the mound, and right when I get there she would say ‘At Last,’ ” Philips said. And the last reason is one he might not want his teammates to find out about. Last night: Newcomers Anderson Tejeda and Leody Taveras bolsted Spokane's offense in a 6-4 win over Salem-Keizer. Tonight: The Indians take on the Volcanoes in game two of the team's five-game series. Sal Mendez is the probable pitcher for Spokane.